WRL’s commercial Coastal Imaging projects are managed by Principal Coastal Engineer Matt Blacka. Matt brings his love of the beach, his expertise in coastal processes and his experience as a Project Manager to the Coastal Imaging team. His initial role in the team was to analyse morphological changes and erosion/accretion processes for Gold Coast and Narrabeen/Collaroy beaches, based on images and data collected by the Coastal Imaging program. These days Matt has a hands-on role in system development, deployment and operation as well as reporting, contract management and project management. Doug Anderson helped the Water Research Laboratory establish the Argus Coastal Imaging system in Australia and developed many of the automated data processing and content delivery systems in use today. After spending a few years in inland Canada, Doug returned to the land of sun and beaches, and once again plays a vital role as a technical advisor and quality assurance reviewer for WRL’s commercial Coastal Imaging programs. WRL’s primary Coastal Engineer providing routine monitoring services for the commercial coastal imaging projects is Erica Davey. Erica has been working with WRL Coastal Imaging since the commencement of the station upgrades for the TRESBP project. She brings to the team a passion for all things coastal, an eye for detail and rapidly developing technical skills. Erica looks at the images daily and loves being able to observe the beaches changing. As well as conducting the routine image processing and reporting, Erica also manages and updates the WRL Coastal Imaging website. Nathan Guerry is highly skilled in computer programming and regularly applies these skills to technical aspects of Coastal Imaging such as field station configuration and image processing. Nathan assists with the routine monitoring and reporting services for the commercial Coastal Imaging projects, as well as development of custom computer coding required for specialist image and statistical analysis. Larry Paice is the Coastal Imaging team’s Technical Officer, assisting with fabrication of specialist field station components, calibration and installation of cameras and maintenance of field station hardware. While Larry brings a wealth of skill as a qualified carpenter and builder with 15 years’ experience in top-end residential construction, he also spends his spare time surfing and photographing the beach – a perfect background for being part of the Coastal Imaging team. Professor Ian Turner installed the first Australian-funded Argus coastal imaging station in Australia in 1999 and continues to play an active role in ongoing Coastal Imaging projects. Ian is the Director of the Water Research Laboratory and manages a number of research projects that are integrated with the Coastal Imaging program. He provides strategic advice and vision for the future goals of Coastal Imaging at WRL. Dr. Mitchell Harley is the manager of the Narrabeen-Collaroy coastal monitoring program and has over 10 years of experience in coastal imaging and advanced coastal monitoring technology. 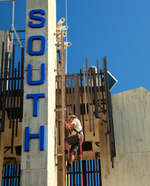 Mitchell undertook his PhD at UNSW, developing and applying new coastal imaging tools as part of an Australian Research Council project on long-term beach response to wave and climate forcing. He subsequently moved to Italy for five years, where as part of several significant European research projects he managed a number of coastal imaging stations along the Italian coastline. In 2015, his fondness for Narrabeen Beach saw him return to WRL to take up his new role and continue the expansion of this unique multi-decadal dataset. Dr Kristen Splinter is a Senior Research Associate at WRL. She completed her PhD in 2009 at the Coastal Imaging Lab under the guidance of Professor Rob Holman at Oregon State University. Kristen arrived down-under in 2009, spending two years on the Gold Coast before touching down at WRL in 2011. 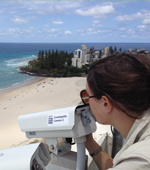 She is a member of the 3-year ARC funded project Australian Coastal Observation Network: Monitoring and Forecasting Coastal Erosion in a Changing Climate. Kristen’s research focuses on the development of long term shoreline change models, with much of this model development reliant on longterm Argus shoreline data sets, as well as monitoring beach morphology at 10 sites along the NSW coastline and assessing the capability of surf cams to measure relevant surf zone parameters for coastal monitoring purposes.